Before Minnesota’s proposed voter photo ID constitutional amendment appears on the ballot it will probably appear on a court docket. 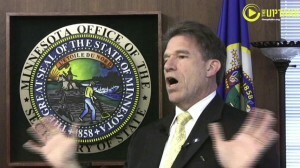 “I will be sued by a lot of people” says Minnesota Secretary of State Mark Ritchie. He expects lawsuits over the ballot question language which doesn’t mention the provisional balloting explicitly spelled out in the constitutional amendment and the end of same day registration which is implicit in the amendment language. “That kind of chaos is the kind of thing that has pushed local election officials to come out very strong, so far, against this,” says Ritchie. Photo ID 18th century, not 21st century technology. Ritchie doesn’t buy the Republican argument that requiring a government issued photo ID to vote is a 21st century voting system. “It’s really from the 18th and 19th century.” A more forward thinking system Ritchie promoted called electronic poll books received little support from Republicans. It still has visual verification of the voter at the polls, but it puts the onus on the government to provide the photo which is kept in an electronic database. A letter from the Archbishop talking about marriage being between "one man and one woman" is posted near a polling place that also happens to be a church.